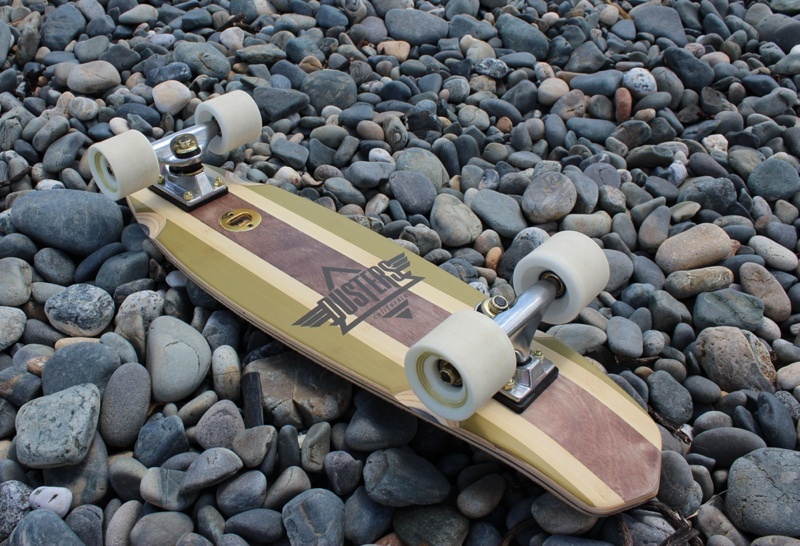 Indulge yourself in a splash of retro with the Ace High skateboard from Dusters. This creatively designed board is brilliant for anything from cruising along the beach walkways to smashing down the ramps. 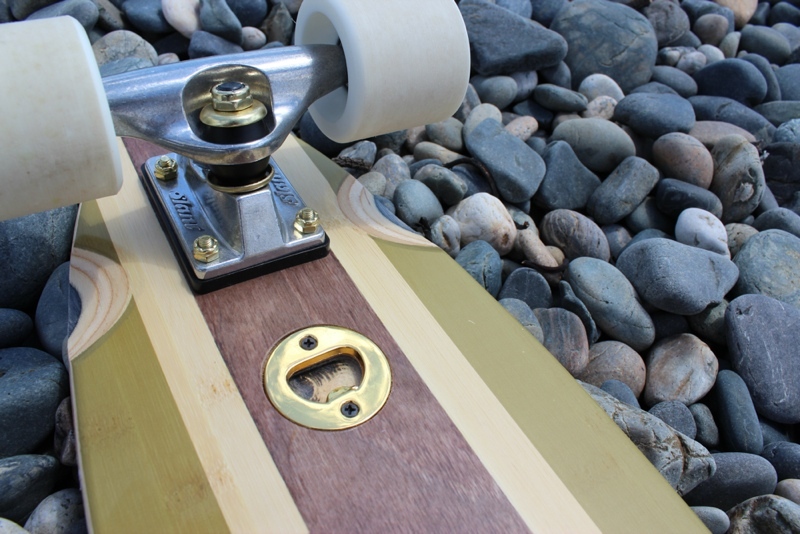 Its compact characteristics unleash a desirable board to take around outdoors and just throw in the back of the car when done. It's a lightweight and small board measuring 27 inches in length and 7 inches in width at the thickest point. The regular Ace Cruiser measures only 23 inches so the Ace High is more comparable to the Penny Nickel Skateboard we reviewed recently which measures an identical 27 inches. 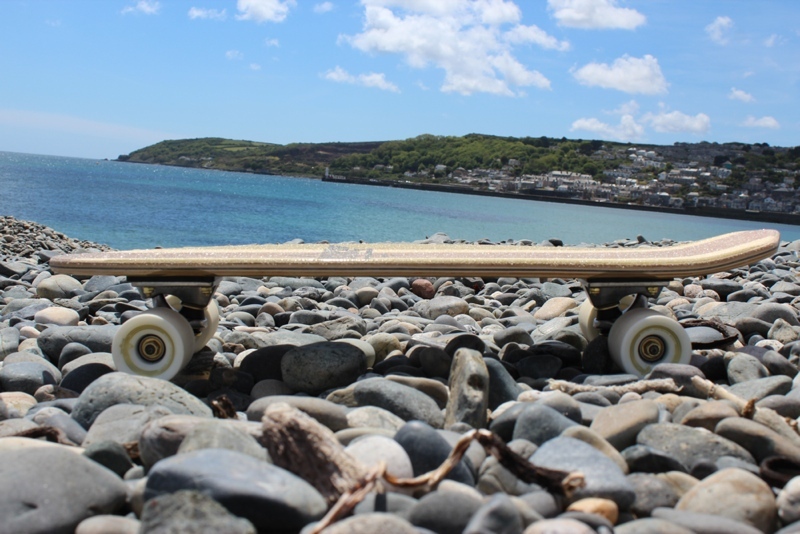 This isn't really a straight up skateboard though, we would categorise this as being within the same tier as the Penny boards and describe it as being more of a skateboard/longboard hybrid; the name for this is a shortboard. It fits a segment of the skate market which at the present time seems to be exploding in popularity. We suppose these boards essentially refer back to the 70s skateboards of this nature, only now they have all the modernised parts. The new summer 2013 California inspired designs are an ultra stylish concoction of stripes that come in three variants which many will be eager to rock this summer. The first is called 'Apple Wood' which consists of orange stripes on ravishing split apple wood and maple veneers, with semi-translucent wheels. The version we have is 'Bamboo', which consists of brown, gold (looks more green to us) and white stripes upon charming split bamboo and maple veneers, with white wheels, and the last variant is the 'Camo' which has a camouflage design upon what appears to be bamboo and maple veneers, with semi-translucent red wheels. All boards are covered in a clear broadcast grip which looks like little sugar crystals scattered and glued onto the deck and is only evident when viewed up close. We do love to see clear grip implemented because it allows the design on the top of the deck to be visible. Our bamboo version looks very smart; the mix of bamboo, bright stripes and popping white wheels really creates a desirable skating object for the fashion conscious. It's definitely one of the best looking shortboards we've ever seen or ridden, it jumps to its own beat. Other colour schemes previously released are available and these include a block red with black traditional grip tape stuck to the top of the deck. Another edition is the Dave Hackett Ace High, a board designed by the legend himself. The deck has an extremely mild taco concave, so this is a real 70s California styled cruiser, and foot placement doesn't suffer from this. The deck has an excruciatingly low degree of flexibility but this is OK. We found riding the board to be comfortable, even during excessive durations, and steering and general manoeuvring was very solid on the flat as the grip locked us in. The deck is a 10ply construction but the ratio of bamboo to maple isn't evident when inspected and no information online details this either. From our testing and general riding we can confidently vouch for the board's sturdy build; slamming it into dense objects and general rough riding brushed off the Ace High's wooden shoulders with ease. However, the board's paintwork does scratch easily which is always traumatic at the beginning. 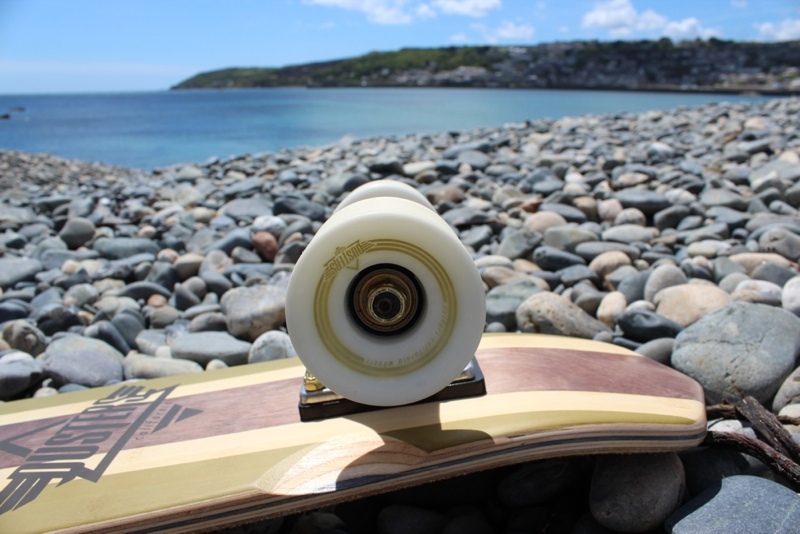 The factory setup comes with 62mm 83a Duster wheels which have a rough texture ingrained onto them straight from stock. This texture eliminates the need for a true break-in period, which is nice. They deploy fantastic grip and avidly stick when on either extremely smooth or vigorously rough terrains. The bearings within the wheels are Speed Demon Abec 5's, and these definitely add to the smoothness of the ride. And for bearings of an Abec 5 measurement they keep speeds ramping along effortlessly. Cruising down busy sidewalks and tearing up every straight in sight is what this board has been brought into the world to do and it does so sensationally. It's a fantastic commuting board and the size and weight only magnify this aspect. 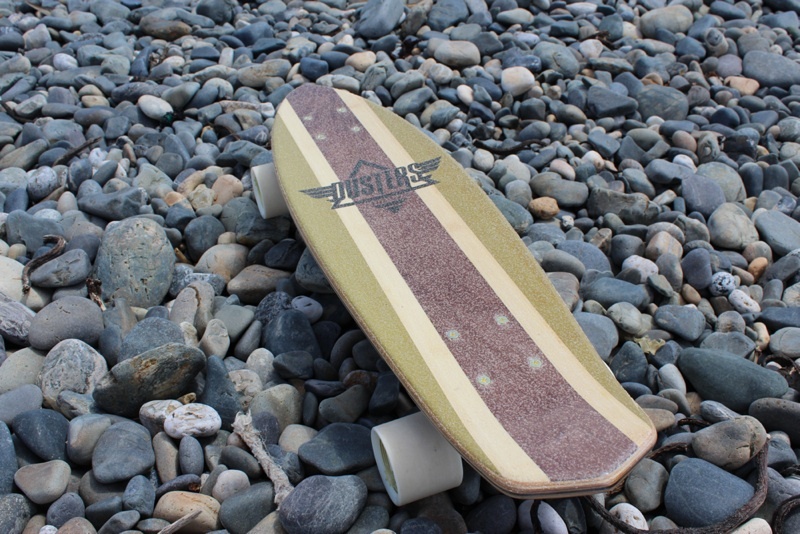 The Dusters Ace High has soft-medium in hardness bushings, we couldn't find the exact measurement of their hardness but we felt they portrayed great credentials for zippy, surf-like carving. Again another layer of excellence to add to its brilliant cruising qualifications. 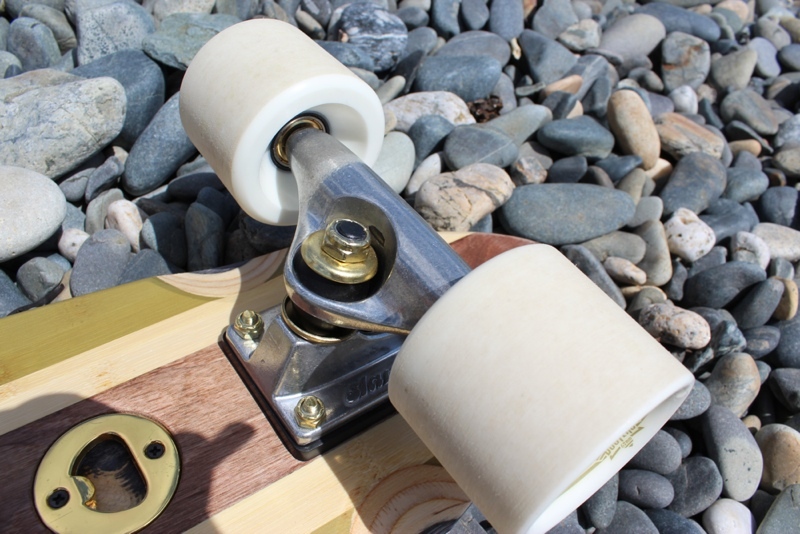 The Slant 4.25" trucks with 1/4 inch risers hold the board above the ground a tad more than some skateboards but they prevent cracking of the bamboo deck as the riser shock-pads avoid the trucks being fixed directly to it. We have no complaints about these trucks, they get the job done and importantly maintain balance. Bombing hills is a mixed story. Slopes and hills of a medium steepness should be ridden with caution but experienced skaters will find that it's possible to ride down them and enjoy the experience. Even breezy carving can be pulled off; not to the level of a longboard but it's possible. Going down steep hills at speeds of 30mph and over will encourage the board to shake violently, tightening the trucks may prevent this but that would forfeit the steering and carving capabilities. The deck does feature a kick tail, so tricking it out is firmly on the agenda. Ollies, kick flips, sliding and anything similar in nature is possible. Ramps and bowls are pretty enjoyable to thrash too, however landing from any trick which involves a mid-air performance can be quite a strain on the feet and legs due to the board's stiff deck. In this rergard the Penny Nickel has the edge because of its more liberal flexibility in comparison. Something we smiled at when we first held the board was its quirky inlaid bottle opener located on the bottom side of the deck. This allows you to open any delicious bottled beverage after a long day of cruising. It is actually something we've found useful unexpectedly, especially if you keep the board in your car everywhere you go. You can pop out the Ace High when someone is eager to drink a bottled beverage and become the saviour of the day. We have really enjoyed riding the Dusters Ace High Skateboard. It imports the spirit of California, wrapped up within a fun energetic cruising perfection package!